NB. A jar of this product was given to me free for me to review. All opinions are my own! Hey everybody! Today I’m brining you a double post – half review half recipe. I’m sure you’ve all noticed that I’ve been quite quiet on the blogging front recently, and not without good reason. Throughout February I was taking some very important law exams. Results don’t come out for ages yet, but I don’t think I had any disasters. I’ve also been on holiday! I was instantly intruiged by LovePickle because they looked like a fresh and funky company selling one of my favourite things – Indian pickles. They kindly offered me a (free) jar to review: all I had to do was decide the heat! (Mild, medium, hot and extra hot). I went for hot, and was pretty confident I could stand the heat. One of the things that instantly drew me to the pickle, was that I wasn’t bombarded with an array of fancy flavours. Now they say variety is the spice of life, but it’s never a good thing to be a jack of all trades and master of none. The LovePickle pickle is handmade from ripe tomatoes, fresh chillies, garlic, ginger, mustard oil and seeds plus a selection of carefully selected quality herbs and spices. They have perfected their recipe only ever tweaking the heat of the finished product so that they know the taste is the best it can be every time. 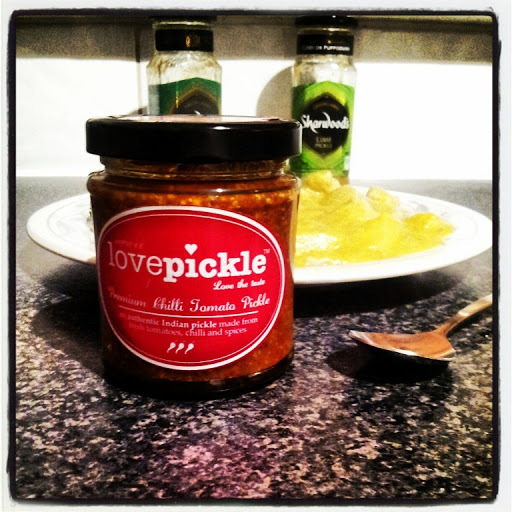 LovePickle stress how it can be used in a whole variety of ways – either served with poppadoms and naan bread, as an accompaniment to main courses or as an alternative to chutneys, relishes and ketchups. So far I’ve served it up alongside a variety of home-made currys, and it goes particularly well with the korma which I am sharing with you below. So what did I really think of the pickle? You can most definitely tell that it is a tomato based pickle, and I must admit I usually opt for lime or other fruit based pickles with my meals. However, unlike some, this pickle is not too sweet. You get a rich, deep tomato flavour as a base which the spices and chilli heat is built on top of. It is a very well rounded pickle and I think this is what makes it so versatile! I would happily serve this as a dip for crisps at a party, or alongside poppadoms and curries at dinner time. If you want to try the pickle for yourself you can find the whole range on the LovePickle website. or follow their facebook or twitter pages (@Lovepickle_uk). Now, on to the korma I’ve been serving alongside this pickle! The Indian takeaway is one of the nation’s most loved dishes. But with many recipes including ghee or copious amounts of oil, the kind of curry that gets delivered to your door is also filled with extra fat and calories you just don’t need. I’ve been cooking my own curries for years now, but never have I even tried to recreate a “take-away” style curry before, until now. Low-fat creamy sauces have become a bit of a ‘thing’ of mine recently and I’ve been trying to find ways to recreate indulgent dishes with less of the fat. 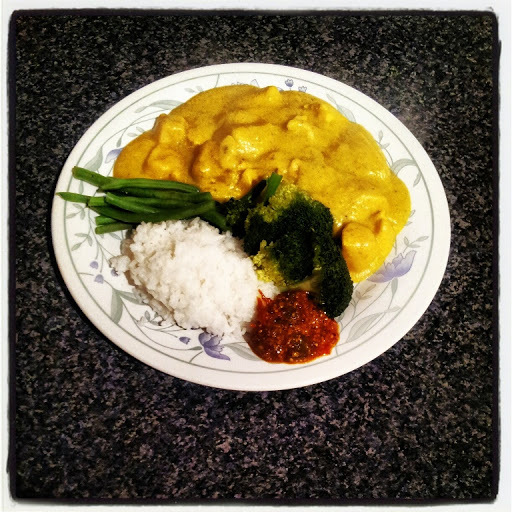 This korma is another attempt at doing just that! 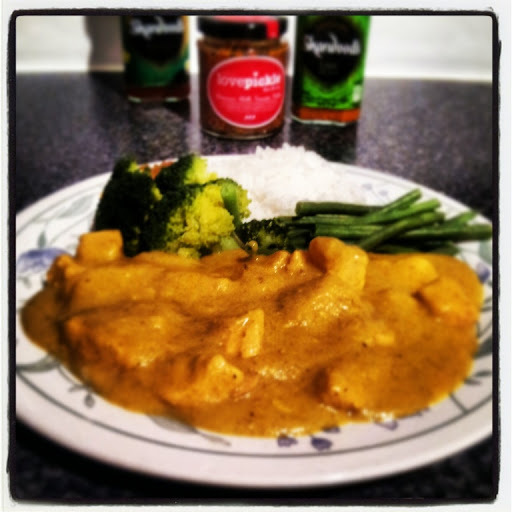 It is delicately spiced, with all the traditional spices you would expect to find in a take-away korma, however, by replacing cream with crème fraiche, and by using a food processer to get a thick and creamy base for my sauce I am able to bring a taste of India into your kitchen. The tumeric and saffron give the sauce a brilliant yellowy colour in true take-away style so you don’t feel you’re missing out on any part of the experience. This recipe also creates a good helping of the creamy sauce, so is great for mopping up with a sweet peshwari naan, wholesome chappathi or vegetable stuffed paratha! Sound too good to be true? Give this recipe a go and let me know how you get on. Heat the oil in a pan and fry off the onions and garlic (finely chopped) with the ginger (grated) and a pinch of salt. Cover with a lid and cook for 10-15 mins until translucent, stirring every now and then to make sure they don’t stick! Once the onions are soft add the cumin, coriander, cardamom seeds, and turmeric and chilli powder. Cook for another 5 mins. Lastly add the flour, saffron and sugar. Slowly begin to add water to the pan as if you are making a roux. Make sure there are no lumps then let it simmer for 10mins until it has started to thicken. Put this back on the pan on a low heat and add in the cloves, bay leaf and crème fraiche. Keep stirring and bring it up to a gentle bubble. Chop the chicken breast into bite size pieces and add to the pan. Let this cook for 15-18mins until it is cooked through. Season with some black pepper and serve with basmati rice.